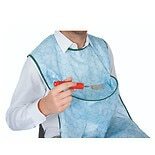 Keep your patients clean and comfortable with adult bibs. 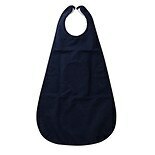 There are bibs in different lengths that are made with various types of material. 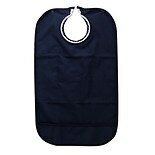 Most bibs for adults have a backing that prevents moisture from coming through to patients' clothes to keep them dry. Brands such as Essential Medical Supply offer adult bibs for patient care here at Walgreens.com. 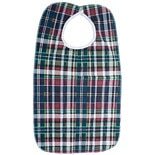 Some adult bibs have a pocket across the bottom to catch crumbs for easier cleanup. There are adult-size bibs that are longer to protect a larger area. Look for machine-washable bibs for easy care. 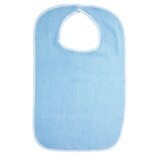 You can also find adult bibs with closures that make them simple to put on and take off. We have a wide selection of home health care products and supplies to help you care for your patients. We carry patient gown for simple, comfortable clothing. 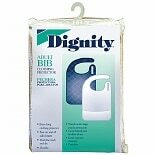 There are bedding and accessories as well as bathroom safety products and mobility equipment accessories.